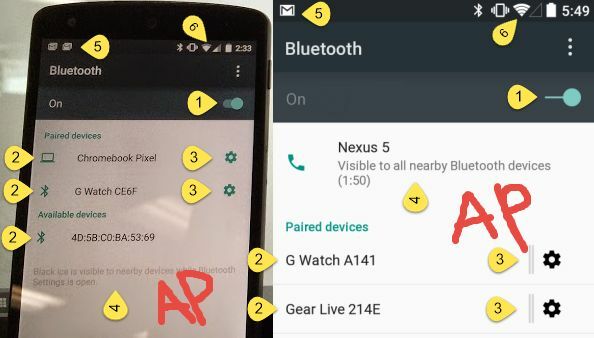 New photos of Nexus 5 in the latest update of Android L spotted on Google+. The date on the build says September 4, this new build of the developer preview of the next major version of the Google OS is slightly different from previous ones. Icons Wifi and network signal yet become flatter. More bars but now a space more or less depending on the full signal strength. The Gmail notification icon now shows several envelopes stacked on top of each other, giving a thickness effect. Is it to show the number of messages or the presence of more unread messages? Hard to say but if it ever were to happen, it would be an improvement rather welcome. The switch to enable or disable a function change look in this last build of Android L and no longer meets the basic guidelines of Material Design. Is it a final update or test from Google?Again, it will wait to find out. The serrated wheel settings are now back in mass to better adapt to the graphic codes of Material Design. It thus takes a turquoise color, like the other elements. As you can see, each device connected via Bluetooth now seems to be identified by an icon of its own, facilitating the differentiation For now, only the Chromebook Pixel is visible but it is quite possible that the final version provides icons for watches and other accessories. The general interface Bluetooth settings also changes and the camera is constantly visible even if not at the top of the interface. If a benchmark yesterday announced the arrival of Android 5.0 Lion here is "LMP" which is mentioned by immediately think of " Lemon Meringue Pie ". Is it just a code name or initials of the final version? Knowing that last year, "Key Lime Pie" was mentioned very late before the official announcement of KitKat, it is quite possible that once again, the Google OS takes the name of a candy bar. Note also that Google's services have been upgraded to 6.0, whereas for us they are still version 5.0.89.